To Cite: Osta A, Vasli P, Hosseini M, Nasiri M, Rohani C. The Effects of Education Based on the Health Belief Model on Adherence to Standard Precautions among Operating Room Staff, Iran Red Crescent Med J. 2018 ; 20(S1):e60112. doi: 10.5812/ircmj.60112. Background: Operating room staffs are constantly subjected to a wide range of risks and injuries; therefore, any attempt to increase their safety through education is justified and considered a necessity. Objectives: The aim of present study was to determine the effect of education based on the health belief model on adherence to standard precautions in operating room staff. Materials and Methods: This single-arm clinical study was carried out with a single-group, before-after study design. Seventy eligible operating room staff members from a hospital in Islamabad-e-Gharb, a city in Iran, were selected using the census sampling method in 2016-2017. The educational program, based on the constructs of the health belief model and related to taking standard precautions, was completed by operating room staff in three separate 30 to 45-minute sessions. Data collection tools included a demographic questionnaire and six researcher-created questionnaires based on the health belief model constructs and a standard self-efficacy questionnaire. The validity and reliability of all questionnaires were assessed and verified. Data were collected and analyzed before and 4 weeks after the educational program. Both the descriptive and inferential statistics (paired t-test) functions of SPSS version 22 were used to analyze the data. Results: Nearly 85.7% of the operating room staff participants were men, and their mean age was 37.30 ± 6 years. The means and standard deviations of adherence to the standard precautions before and after the education were 35.17 ± 5.65 and 37.71 ± 5.83, respectively. The results of the paired t-test showed that except in case of cues to action, education based on the health belief model brought about significant changes in the constructs of this model, including perceived susceptibility (p = 0.03), perceived severity (p = 0.01), perceived benefits (p = 0.04), perceived barriers (p = 0.01), self-efficacy (p = 0.03), and adherence to standard precautions (p = 0.04). Conclusions: Nursing managers, nurses, and operating room staff can use the findings of this study for education and assessment of adherence to standard precautions. Each year, more than three million healthcare workers (HCWs) are at risk of exposure to pathogens that can be transmitted through the skin (1). This is especially important in the operating room (OR) due to the large number of exposure-prone activities and high risk of acquiring infection (2). Adherence to standard precautions (SPs) guidelines is required to decrease the risk of occupational exposure and disease transmission to OR staff (3). SPs must be strictly practiced in case of any possible contact with blood and other bodily fluids (excluding sweat, disregarding their contamination with blood), non-intact skin, and mucous membranes (4). Elements of SPs consist of the following: 1) washing hands, 2) using hand gloves, 3) using self-care products and gloves during procedures and patient care, 4) using appropriate procedures for contaminated materials, 5) proper transferring and management of waste, and 6) cleaning and disinfecting contaminated surfaces (5, 6). Among the above items, hygiene-promoting practices are notably important when it comes to preventing subsequent complications (7). Although these instructions have been recommended for a long time, the evidence shows that HCWs do not follow the principles of SPs completely (8-11). To date, the only protection against infection is to modify behaviors and practices to minimize risk. Interventions tailored to different staff in the OR to improve adherence to standard precautions are needed (12). One of the important intervention that can improve adherence to SPs is education (13). The goal of education is to improve the HCWs’ knowledge and attitudes, and ultimately, to change their behavior so that they adopt a better lifestyle (7). To achieve this, healthcare education experts develop and utilize theories to educate and modify behaviors (14). Health behavior theories are mostly used for understanding health behaviors and assisting professionals in altering behaviors (15). The health belief model (HBM), the first model designed for health-related behaviors, was developed in the 1950s as the first social psychology model related to health and prevention (16, 17). This model is used in education for different health behaviors (14), such as prevention of osteoporosis (16); dietary knowledge, attitudes, and behaviors in medical students’ nutrition (18); and dental health behaviors (19). Six constructs of the HBM are as follows: perceived susceptibility (how vulnerable the individual feels to health threats), perceived severity (the individual’s perception of the severity and harshness of a threat), perceived benefits (the individual’s beliefs about whether a specific action would reduce the risk of a disease), perceived barriers (the individual’s belief about his or her ability to overcome execution problems or negative outcomes of suggested actions), and cues to action and self-efficacy (the individual’s perceived ability to take preventive actions) (20). This model illustrates the relationship between health beliefs and health behaviors (21). Figure 1 illustrates the relationships among the HBM constructs (22). The HBM has been used for teaching SPs and controlling infections (23), such as by preventing needlestick injuries (14), medical students’ compliance with SPs (24), and nurses’ behavior in preventing hospital infections (25). Although some studies have shown that education based on HBM can alter the adherence to SPs, as the investigators pointed out, it is still important to use this model to investigate the effects of education on the adherence to SPs by OR staff. This is because the risk of transmission of infection to OR staff is greater than it is for other HCWs, as OR staff face a greater risk of needlestick and sharp object injuries, as well as exposure to blood and bodily fluids (26). In the present investigators’ view, the results of this study would be useful for improving the clinical staff, especially OR staff adherence to SPs and to healthy behaviors. This study was designed to determine the effects of education based on HBM on adherence to SPs by OR staff. This study is a single-arm clinical study with a before–after design that was conducted by a census of all OR staff at Islamabad-e Gharb Hospital (IGH). As a governmental and referral center in western Iran, this hospital serves over 450,000 patients annually. This study used a single-group design because the mentioned hospital is the only hospital in western Islamabad-e Gharb, and the researchers faced sampling limitations. Since the research was conducted in the form of a single-group study, the scores for before the education were considered as a control effect. The inclusion criteria were the ability to read and write in Persian, desire to participate in the study, and working in an OR. The exclusion criteria were unwillingness to continue participating in the study and not totally completing the questionnaires. The total number of staff in the OR was 84, and 73 of them were eligible to enter the study, as determined using the census sampling method (considering sample attrition). The OR staff included nurses, OR technicians and specialists, and anesthesia technicians and specialists with associate and bachelor degrees. Three subjects were excluded from the study for incomplete participation in the educational sessions, and thus, with the 5.5% reduction in the sample size, 70 subjects were ultimately included. The flow chart of the study participants is presented in Figure 2. The content of the educational sessions was prepared according to the constructs of the HBM and the latest references related to SPs. The quality content was verified by members of the research team and three faculty members of the School of Nursing and Midwifery of Shahid Beheshti University of Medical Sciences (SBMU). The content for perceived susceptibility and perceived severity included biological hazards in the OR, possible dangers of unsafe practices to protect against biological hazards and SPs. In order to improving perceived benefits, perceived barriers, and cues to action, researcher educated advantages, barriers, and helpful resources for adherence to SPs respectively. In the following, some practical examples of the possible risks of exposure to hazardous biological agents and needlesticks are listed; these were presented to the learners to enhance their self-efficacy, and they were requested to state how to confront them. Each group consisted of 8 - 12 participants, and every session was held three times for each group in a class of the hospital. This ensured that all the participants would have the opportunity to participate in an education session. Educational sessions were held in three parts, each lasting 30 - 45 minutes. Data collection tools for acquiring demographic information and seven HBM constructs were designed by the researchers (researcher-made questioners) from the literature, and especially, the world health organization (WHO) guidelines on SPs (28). The tools included the following: a demographic information questionnaire with 9 questions; a perceived susceptibility and perceived severity questionnaire, with 10 questions on each topic; a perceived benefits and perceived barriers questionnaire, with 7 and 8 questions, respectively; a cue to action questionnaire, with 13 questions; and a self-reported adherence to SPs questionnaire, with 18 questions. In addition, for the self-efficacy construct, standard a Bandura self-efficacy questionnaire consisting of 10 questions was used. In all the above-mentioned tools, except the adherence to SPs questionnaire, the answers were assessed using a 5-item Likert scale from 0 (completely disagree) to 4 (completely agree). The answers for the adherence to SPs questionnaire were scored on a 4-item Likert scale from 0 (never) to 3 (always). The validity of the questionnaires was confirmed by experts at the SBMU’s School of Nursing and Midwifery. The demographic questionnaire was assessed for face and qualitative validity. Given that the Bandura self-efficacy questionnaire is standard, it did not require validity confirmation. The other questionnaires designed by the researchers were examined in terms of the face and qualitative validity, content validity ratio (CVR), and content validity Index (CVI). A CVI of 86.0 - 97.0 was obtained for all questionnaires from a relevance point of view. To assess the reliability with the test–retest method, all questionnaires were given to 20 OR staff from another hospital twice, with a 2-week interval in between, and an internal consistency coefficient (ICC) of 73.0 - 88.0 was obtained. The Cronbach’s alpha of the questionnaires ranged from 73.0 - 91.0, proving that they were all valid instruments. Between July 2015 and December 2016, data collection was carried out in two parts before and 1 month after the intervention. Data were analyzed using IBM SPSS version 22. The number of missing variables was low because the questionnaires were checked immediately after being completed. The Kolmogorov–Smirnov test was used to determine whether the responses were normally distributed. Descriptive statistics, such as the frequency, percentage, mean value, and standard deviation, and inferential statistics, such as paired t-tests, were used. This study is based on a master’s thesis project. The topic of the study was approved by the ethical committee of the School of Nursing and Midwifery at SBMU (code IR.SBMU.PHNM.1395.399). Entrance to the research area was approved by hospital officials. During the study, written informed consents from the research subjects were obtained, and the subjects were free to leave the study at any time if they desired to do so. The demographic characteristics of the OR staff showed that almost 85.7% of them were men and 14.3% were women. Their mean age was 37.30 ± 6 years, and 40% of the respondents were in range of 26 - 30 years of age. Most of the staff were married (62.9%) and had bachelor’s degrees (71.4%). The majority had 1 - 5 years of work experience (37.1%) and were contract employees (31.4 %). Most staff had no previous SPs education (73.1 %), and the mean duration of participating in educational sessions was 1 hour, with a standard deviation of 1.37. Demographic information is depicted in Table 1, while the standard deviation and significance of scores for the HBM constructs regarding adherence to SPs before and after education are depicted in Table 2. Based on these findings, except for cues to action, significant differences were obtained before and after the education in all constructs. The Comparison of mean scores of HBM constructs and adherence to SP is presented in Figure 3. This study was the first to investigate the effect of education based on HBM on adherence to SPs among OR staff. The authors considered the application of HBM as a valuable approach in this study. The common perception is that the main focus of this model is on the determinants of health, and this makes the HBM an appropriate option for addressing health issues with health-related outcomes (29). Moreover, addressing infection prevention and control in the OR is a significant issue for maintaining and improving the health of patients and HCWs (30). The results of this study showed that education based on HBM can improve OR staff adherence to SPs by means of altering most of the constructs. One alteration was related to the construct of perceived susceptibility and perceived severity, meaning that with education, OR staff’s understanding regarding the importance of controlling infectious diseases, severity of facing infectious hazards, and consequences of neglecting SPs improved. The same results have been obtained in other studies. For instance, the results of a study by Mohseni et al. showed that educating SPs based on HBM could significantly alter the perceived susceptibility and severity of medical students (24). In a study by Koohsari et al. similar results were obtained, showing that after SPs education based on the HBM regarding needlestick injury, medical staff’s perceived susceptibility and severity increased (23). In another study, increased intent to receive human papillomavirus (HPV) vaccination among college males after education applying health beliefs was discerned (31). Another finding of this study was alteration in two other constructs, namely perceived benefits and barriers. This means that after education, OR staff perceived more benefits and fewer barriers regarding adherence to SPs. The findings of this study correspond with many other studies that used the HBM to evaluate the effects of education on health-related concepts and issues. Among these studies, a study by Shojaei et al. can be mentioned; here, the investigators found that education based on the HBM improves coronary artery bypass graft surgery (CABG) patients’ knowledge and behavior (32). A study by Mohseni et al. was not consistent with this study, and medical staff’s perceived barriers regarding the prevention of needlestick injury did not change (24). In another study, the education based on HBM increased both the perceived benefits and perceived barriers concerning healthy food choices among uninsured primary care patients (33). Regarding self-efficacy, our findings were consistent with those of Korsandi et al. In their study, education based on the HBM improved self-efficacy in the elderly regarding blood pressure (14). Similar results were reported in other studies (34). The only construct that did not alter with education based on the HBM was cues to action. In this study, cues to action signified internal or external sources for acquiring SPs-related information. This finding was consistent with that of Mohseni et al. (24). There may have been many reasons for the inability of education to alter this construct, including more frequent and longer working hours of employees and limited access to a library or the internet. The effect of the HBM in predicting and implementing health behaviors has been confirmed (19, 35), and in this study, adherence to SPs was investigated as the desired behavior. According to our findings, education based on HBM can alter staff behavior regarding adherence to SPs, such as washing hands, using personal safety tools (gloves, hat, gown, mask, and glasses), prevention of needlestick injury, and taking necessary measures in the vicinity of sharp and cutting objects. In similar studies, education based on the HBM could affect behaviors regarding the prevention of needlestick injury, adherence to SPs in medical students, controlling hospital infection, and increasing vaccination rates in college men (23-25, 31). The findings confirmed the study’s hypothesis; except for cues to action, the other constructs of the HBM, including perceived susceptibility and severity, perceived benefits and barriers, and adherence to SPs improved as expected. What makes the study unique and powerful is the use of an interventional approach to studying adherence to SPs. Nursing managers, nurses, and OR staff could use the results of this study to educate and evaluate adherence to SPs, and in general, to improve health and performance of the OR staff and HCWs. The strength of present study is to investigate the effect of educational intervention based on a health behavior change model among staff who are at risk of infection and has been less considered in previous studies. During the study period investigators encountered the following limitations, which may have affected the findings: 1) participant fatigue and not answering questions properly, and 2) previous participation of some OR staff in educational programs regarding SPs, and 3) lack of availability of standard and approved instruments. Considering that this study was conducted with a quasi-experimental and single group design due to sample limitations, we recommend that future investigations should be conducted in multiple groups and include different HCWs, such as nurses. Furthermore, investigators recommended studies that investigate factors that can predict HBM-based adherence to SPs. We would like to thank the directors and faculty members of the School of nursing and midwifery and research affairs at SBMU, the Kermanshah University of Medical Sciences (KUMS), the directors of IGH, and all the staff who participated in this study. Authors’ Contribution: Research idea and study design: Ahmad Osta and Meimanat Hosseini; data acquisition: Ahmad Osta; data analysis and interpretation: Ahmad Osta and Parvaneh Vasli; statistical analysis: Malihe Nasiri; supervision on the study: Parvaneh Vasli, Meimanat Hosseini and Camelia Rohani; writing the manuscript: Parvaneh Vasli and Ahmad Osta. 1. Punia S, Nair S, Shetty RS. Health Care Workers and Standard Precautions: Perceptions and Determinants of Compliance in the Emergency and Trauma Triage of a Tertiary Care Hospital in South India. Int Sch Res Notices. 2014;2014:685072. doi: 10.1155/2014/685072. [PubMed: 27433500]. 2. Cutter J, Jordan S. Inter-professional differences in compliance with standard precautions in operating theatres: a multi-site, mixed methods study. Int J Nurs Stud. 2012;49(8):953-68. doi: 10.1016/j.ijnurstu.2012.03.001. [PubMed: 22459981]. 3. Chan MF, Ho A, Day MC. Investigating the knowledge, attitudes and practice patterns of operating room staff towards standard and transmission-based precautions: results of a cluster analysis. J Clin Nurs. 2008;17(8):1051-62. doi: 10.1111/j.1365-2702.2007.01998.x. [PubMed: 18179532]. 4. Pandit AP, Garg SM, Wankar SM, Bhalwar R, Saksena DK. A Study to Ascertain the Adequacy of Observance of Universal Precautions in Acute Medical and Surgical Wards of a Large Teaching Hospital. Med J Arm Forces India. 1998;54(2):115-8. doi: 10.1016/s0377-1237(17)30497-5. 5. Michinov E, Buffet-Bataillon S, Chudy C, Constant A, Merle V, Astagneau P. Sociocognitive determinants of self-reported compliance with standard precautions: Development and preliminary testing of a questionnaire with French health care workers. Am J Infect Control. 2016;44(1):14-9. doi: 10.1016/j.ajic.2015.07.041. [PubMed: 26422181]. 6. Valim MD, Marziale MH, Hayashida M, Rocha FL, Santos JL. Validity and reliability of the Questionnaire for Compliance with Standard Precaution. Rev Saude Publica. 2015;49. doi: 10.1590/S0034-8910.2015049005975. [PubMed: 26759967]. 7. Gholami Fesharaki M, Rahmati-Najarkolaei F, Aghamiri Z, Mohamadian M. Hand-Washing Compliance Rate and the Influencing Factors. Arch Clin Infect Dis. 2014;9(4]). doi: 10.5812/archcid.17316. 8. de Carvalho Nagliate P, Nogueira PC, de Godoy S, Mendes IA. Measures of knowledge about standard precautions: a literature review in nursing. Nurse Educ Pract. 2013;13(4):244-9. doi: 10.1016/j.nepr.2013.02.011. [PubMed: 23507075]. 9. Efstathiou G, Papastavrou E, Raftopoulos V, Merkouris A. Factors influencing nurses' compliance with Standard Precautions in order to avoid occupational exposure to microorganisms: A focus group study. BMC Nurs. 2011;10(1). doi: 10.1186/1472-6955-10-1. 10. Hessels AJ, Larson EL. Relationship between patient safety climate and standard precaution adherence: a systematic review of the literature. J Hospital Infect. 2016;92(4):349-62. doi: 10.1016/j.jhin.2015.08.023. 11. Quan M, Wang X, Wu H, Yuan X, Lei D, Jiang Z, et al. Influencing factors on use of standard precautions against occupational exposures to blood and body fluids among nurses in China. Int J Clin Exp Med. 2015;8(12):22450-9. [PubMed: 26885227]. 12. Chan MF. Factors affecting the compliance of operating room nursing staff toward standard and transmission-based precautions in an acute care hospital. Am J Infect Control. 2010;38(8):666-7. doi: 10.1016/j.ajic.2010.01.015. 13. D'Alessandro D, Agodi A, Auxilia F, Brusaferro S, Calligaris L, Ferrante M, et al. Prevention of healthcare associated infections: medical and nursing students' knowledge in Italy. Nurse Educ Today. 2014;34(2):191-5. doi: 10.1016/j.nedt.2013.05.005. [PubMed: 23725909]. 14. Khorsandi M, Fekrizadeh Z, Roozbahani N. Investigation of the effect of education based on the health belief model on the adoption of hypertension-controlling behaviors in the elderly. Clin Intervent Aging. 2017;Volume 12:233-40. doi: 10.2147/cia.s117142. 15. Guilford K, McKinley E, Turner L. Breast Cancer Knowledge, Beliefs, and Screening Behaviors of College Women: Application of the Health Belief Model. Am J Health Educ. 2017;48(4):256-63. doi: 10.1080/19325037.2017.1316694. 16. Sanaeinasab H, Tavakoli R, Karimizarchi A, Amini ZH, Farokhian A, Najarkolaei FR. The effectiveness of education using the health belief model in preventing osteoporosis among female students. East Mediterr Health J. 2014;19 Suppl 3:S38-44. [PubMed: 24995758]. 17. Villar OAED, Montanez-Alvarado P, Gutierrez-Vega M, Carrillo-Saucedo IC, Gurrola-Pena GM, Ruvalcaba-Romero NA, et al. Factor structure and internal reliability of an exercise health belief model scale in a Mexican population. BMC Public Health. 2017;17(1). doi: 10.1186/s12889-017-4150-x. 18. Tavakoli HR, Dini-Talatappeh H, Rahmati-Najarkolaei F, Gholami Fesharaki M. Efficacy of HBM-Based Dietary Education Intervention on Knowledge, Attitude, and Behavior in Medical Students. Iran Red Crescent Med J. 2016;18(11). doi: 10.5812/ircmj.23584. 19. Rahmati-Najarkolaei F, Rahnama P, Gholami Fesharaki M, Yahaghi H, Yaghoubi M. Determinants of Dental Health Behaviors of Iranian Students Based on the Health Belief Model (HBM). Shiraz E-Med J. 2016;17(7-8). doi: 10.17795/semj39268. 20. Montanaro EA, Bryan AD. Comparing theory-based condom interventions: Health belief model versus theory of planned behavior. Health Psychol. 2014;33(10):1251-60. doi: 10.1037/a0033969. 21. Ghaderi N, Mohammadi S, Ghajari H, Valizade R, Yousefi F, Taymoori P, et al. Predictors of smoking among the secondary high school boy students based on the health belief model. Int J Prevent Medi. 2017;8(1):24. doi: 10.4103/ijpvm.IJPVM_264_16. 22. Glanz K, Rimer BK, Viswanath K. Health behavior and health education: theory, research, and practice. John Wiley & Sons; 2008. 23. 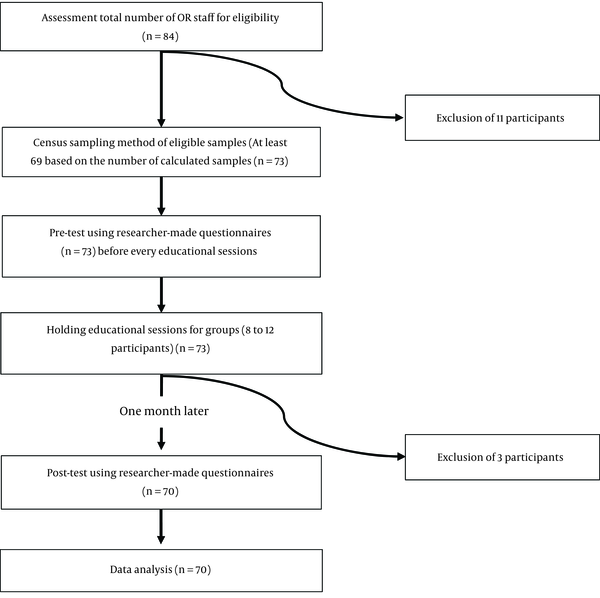 Koohsari M, Mohebbi B, Sadeghi R, Tol A, Rahimi Forooshani A. Assessing the Effect of Educational Intervention Based on Health Belief Model in Improving Standard Precautions Adherence to Prevent Needlestick among Clinical Staff of Hospitals. J Hospital. 2016;15(4):49-57. 24. mohseni M, Mahbobi M, Sayadi AR, Shabani Z, Asadpour M. The Effect of an Educational Intervention Based on Health Belief Model on the Standard Precautions among Medical Students of Rafsanjan University of Medical Sciences. Res Med Educ. 2015;7(1):63-72. doi: 10.18869/acadpub.rme.7.1.63. 25. Ghaffari M, Esmaillzadeh A, Tavassoli E, Hassanzadeh A. Effect of Health Belief Model based intervention on promoting nutritional behaviors about osteoporosis prevention among students of female middle schools in Isfahan, Iran. J Educ Health Promot. 2012;1(1):14. doi: 10.4103/2277-9531.98572. 26. Kasatpibal N, Whitney JD, Katechanok S, Ngamsakulrat S, Malairungsakul B, Sirikulsathean P, et al. Prevalence and risk factors of needlestick injuries, sharps injuries, and blood and body fluid exposures among operating room nurses in Thailand. Am J Infect Control. 2016;44(1):85-90. doi: 10.1016/j.ajic.2015.07.028. 27. Plichta SB, Kelvin EA, Munro BH. Munro's statistical methods for health care research. Wolters Kluwer Health/Lippincott Williams & Wilkins; 2013. 28. World Health Organization . Standard precautions in health care. 2017. Available from: www.who.int/csr/resources/publications/standardprecautions/en/. 29. Orji R, Vassileva J, Mandryk R. Towards an Effective Health Interventions Design: An Extension of the Health Belief Model. Online J Public Health Inform. 2012;4(3). doi: 10.5210/ojphi.v4i3.4321. 30. Aziz AM. Supporting infection prevention in the operating room. J Operat Department Pract. 2014;2(3):121-9. doi: 10.12968/jodp.2014.2.3.121. 31. Mehta P, Sharma M, Lee RC. Designing and Evaluating a Health Belief Model-Based Intervention to Increase Intent of HPV Vaccination among College Males. Int Q Commun Health Educ. 2013;34(1):101-17. doi: 10.2190/IQ.34.1.h. 32. Shojaei S, Farhadloo R, Aein A, Vahedian M. Effects of the health belief model (HBM) based educational program on the nutritional knowledge and behaviors of CABG patients. J Tehran Heart Cent. 2016;11:181-6. 33. Kamimura A, Nourian MM, Jess A, Chernenko A, Assasnik N, Ashby J. Perceived benefits and barriers and self-efficacy affecting the attendance of health education programs among uninsured primary care patients. Eval Program Plan. 2016;59:55-61. doi: 10.1016/j.evalprogplan.2016.08.006. 34. Ghaderi N, Ahmadpour M, Saniee N, Karimi F, Ghaderi C, Mirzaei H. Effect of education based on the Health Belief Model (HBM) on anemia preventive behaviors among iranian girl students. Int J Pediatr. 2017;5(6):5043-52. 35. Jones CJ, Smith H, Llewellyn C. Evaluating the effectiveness of health belief model interventions in improving adherence: a systematic review. Health Psychol Rev. 2013;8(3):253-69. doi: 10.1080/17437199.2013.802623.